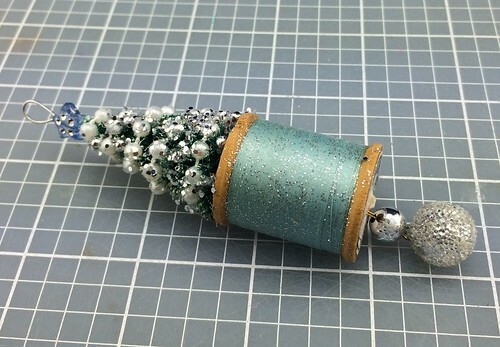 I noticed on Pinterest that my spool ornaments, and the tutorial for the same, get a lot of pins. Since they are popular, I decided to make some for my Etsy shop ChristmasNotebook. If you make any, I’d love to see some pictures! This is what I made. You can’t see it in this picture, but the blue thread is embellished with fine silver glitter. Very pretty! I also made this one with some snow on it. 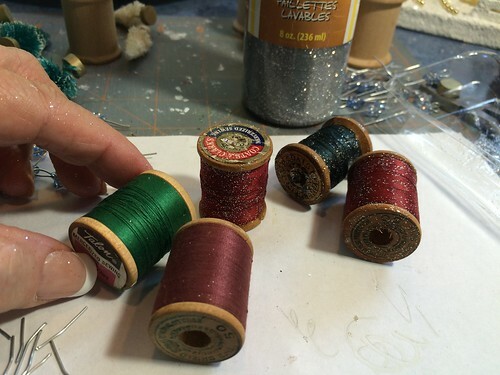 I used some of the spools of thread that I brought back from my parents’ home after my mother passed away. I have three one-gallon jars full of wooden spools from Mom’s stash. Some empty, some with thread on them. Some even have the price on the label. 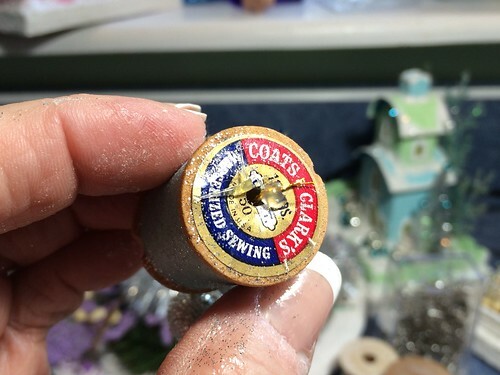 When’s the last time you found a spool of thread for 15¢? The tutorial covers the process, but I thought I’d point out a few things. 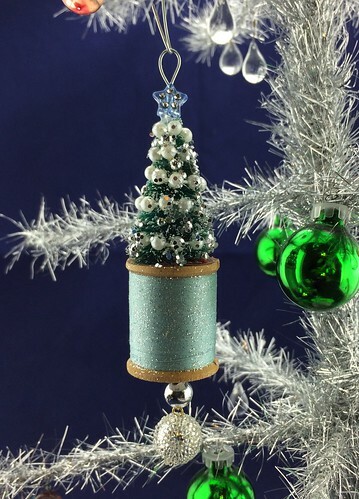 In the tutorial, I used empty spools and wrapped them with paper. 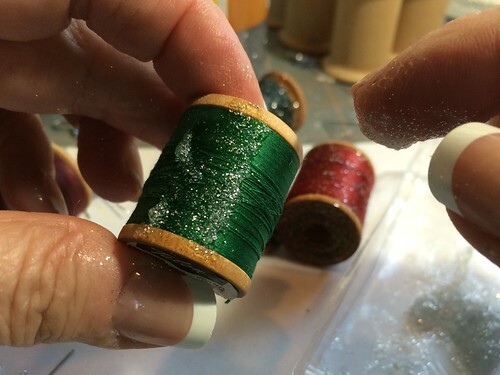 This time, I used glitter glue to glam up the thread and the spool. This is the glue I use. 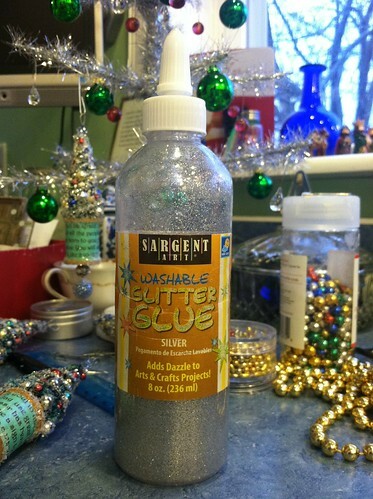 Sargent Silver Glitter Glue. I noticed on amazon.com that it doesn’t get great reviews from some people, but I have never had any trouble or complaints about it. It’s a fine glitter in a clear glue. It can be spread over something without obliterating what it’s covering. I think I’m on my third bottle of the silver. It has always been more “clumpy” than the other colors, and it doesn’t squeeze from the bottle very well, but I just take the lid off and squeeze a clump into a small dish and spread it with my fingers. Works for me. The other colors I’ve used come out easily through the nozzle (gold, blue, opalescent, red and green). 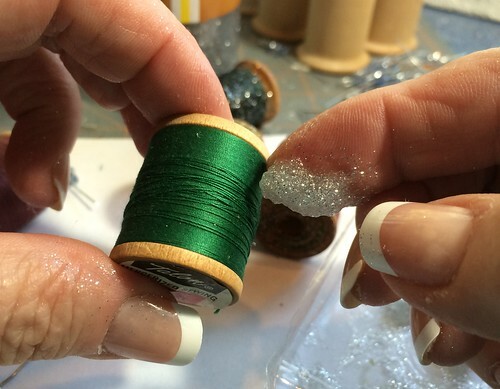 When spreading it over the spool, take time to clean out any that gets inside the holes. 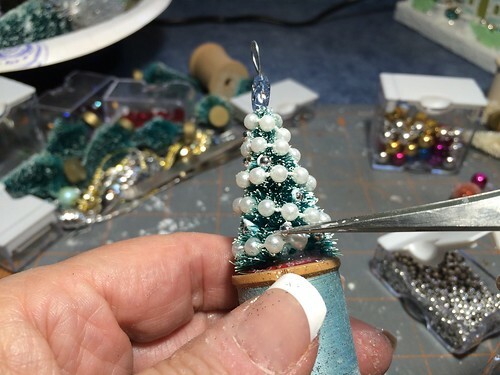 They need to be open so a thread can be placed through the holes to hold a dangling miniature ornament. Or a bell. Or a charm. Whatever floats your boat. The next step is to add the dangle. I use these kinds of miniature ornaments. They can be found at stores like Hobby Lobby, Walmart stores with a large craft department, Michaels, etc. Hobby Lobby has an aisle dedicated to miniature Christmas trees and items to decorate them. 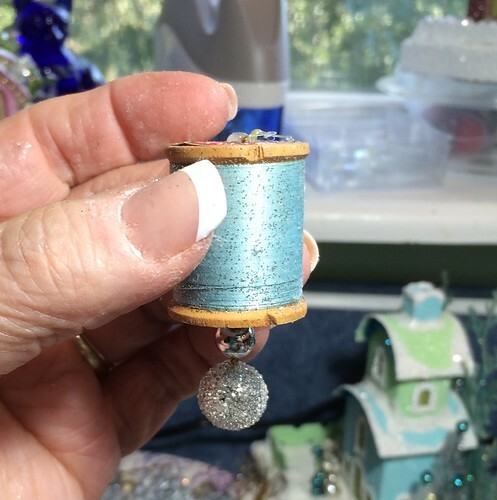 A bead added to the string before pulling the gold cord through the spool adds a little extra bling. A dab of hot glue holds the cord down to the top of the spool. When the glue hardens, the cord can be trimmed close to the glue. Time to decorate the tree. 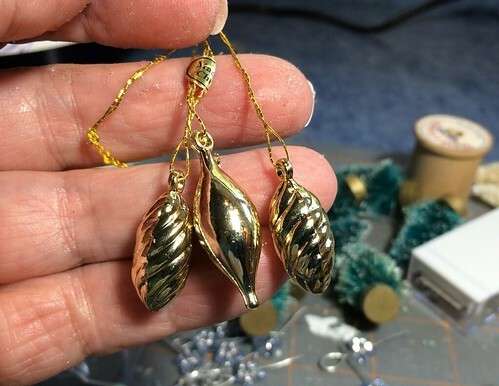 I like to use the small strand beads. They come in many colors and are a nice size for the little bottle brush trees. I dot a little hot glue where I want to start the strand, wind the beads around and fix them with a dot of hot glue half way up and again at the top. Next comes the star for the top of the tree. 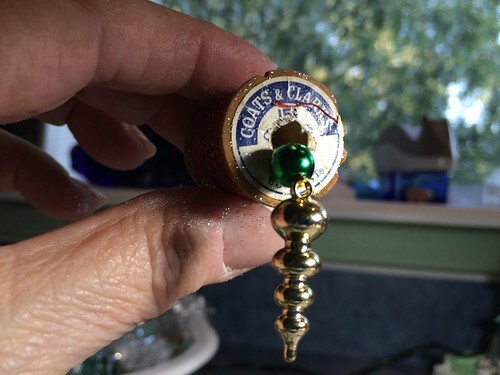 I used a bead with a hole large enough to pass the wire through the bead twice. 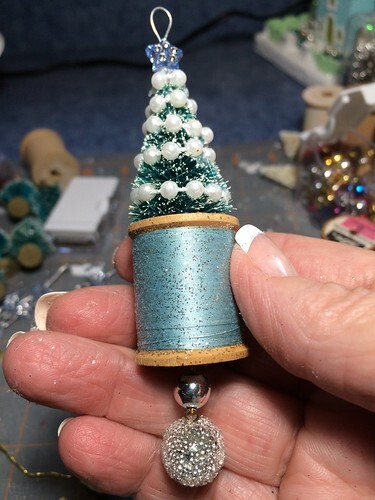 The tutorial shows how to make the tree topper. 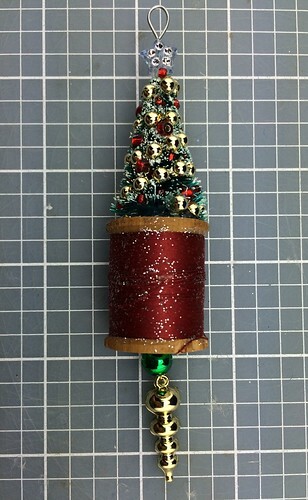 The tree is glued to the spool and we’re almost done. 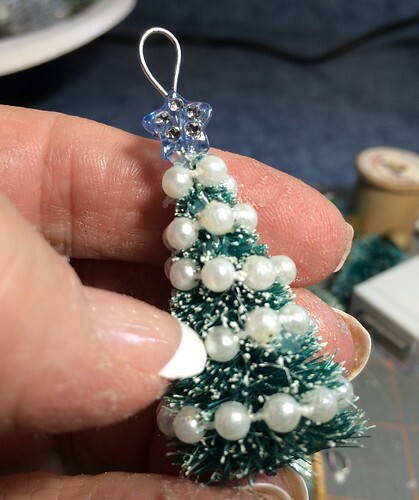 I used my fine point tweezers to add some silver beads to the tree. They do a good job of covering up a little blob of glue or filling a hole in the branches. A sprinkle of glitter over the tree and it’s done. 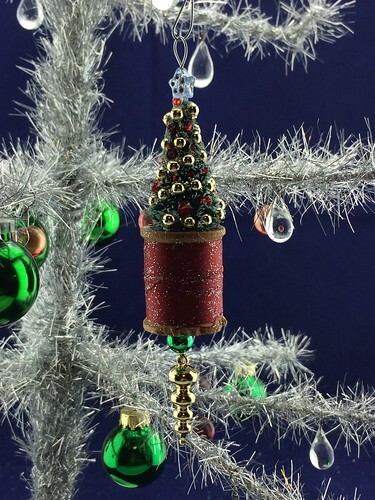 I added red beads to this tree. They are a lot of fun to make. I’ll be adding more to my Etsy shop soon. This entry was written by ~~Rhonda, posted on July 26, 2016 at 12:20 am, filed under ornaments. Bookmark the permalink. Follow any comments here with the RSS feed for this post. Post a comment or leave a trackback: Trackback URL. Very nice. And I needed that poem. It is hard to tread the waters of the unknown while keeping your eyes on Jesus. The trials of life right now are… hard to say the least. *sigh* I love the memories of your mom. 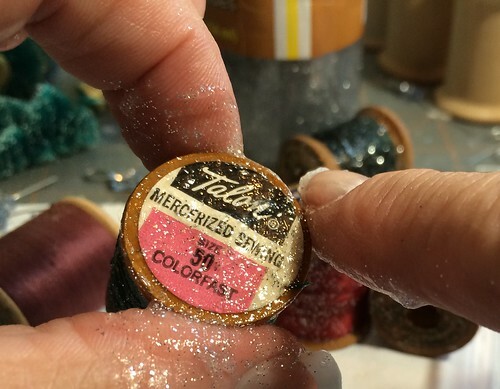 I have some old spools of thread that belonged to Gramma. Not very many, so they stay in a mason jar to look at. Thank you for your post. 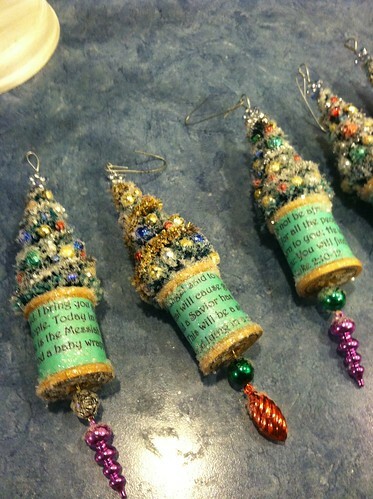 Could you please tell me where you find your star beads for the tree topper? I absolutely love the ones you use. Ursula, thank you for your comment. I wish I knew where those came from. I have had them for years. Finally found a good use for them! 🙂 I have searched the internet, but can’t find anything similar. If you go to Etsy.com and search “star beads,” you will get a lot of returns. Perhaps you can find something there that you like. Good luck! 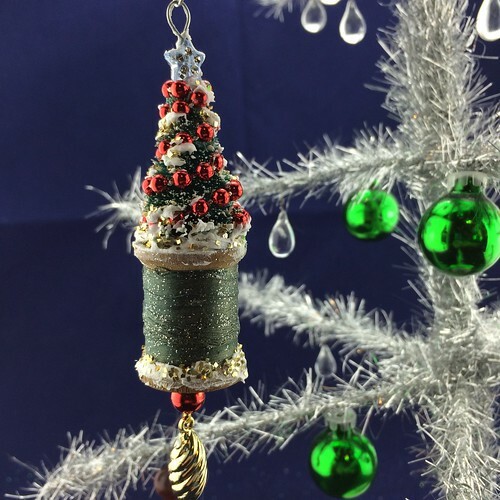 I love your ornaments as a beautiful way to use old wooden spools my Mom had. Trying to find tiny ornaments to put on them is hard. I use the pretty quilting straight pens that have shiny heads. 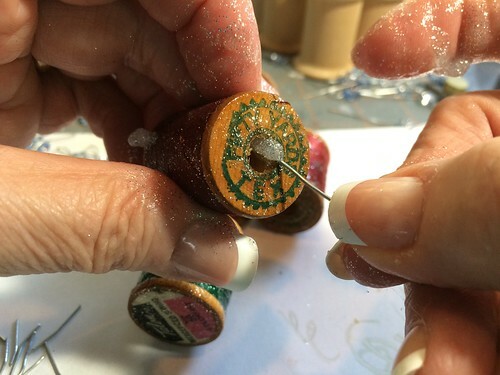 I use wire cutters and cut the pins short and put a little glue on them and stick them inside the bottle brush trees. 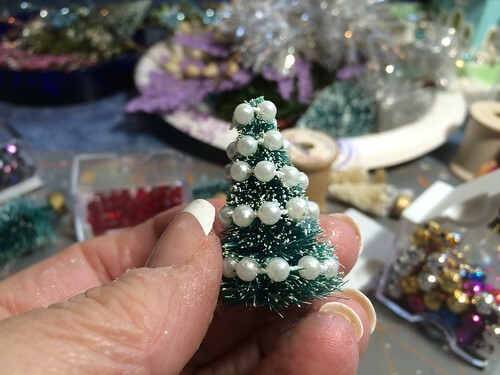 They work beautifully as ornaments on the trees and are fairly inexpensive.